PARIS (AP) — France ordered 10,000 troops into the streets Monday to protect sensitive sites — nearly half of them to guard Jewish schools — as it hunted for accomplices to the Islamic militants who left 17 people dead as they terrorized the nation. Prime Minister Manuel Valls said the search is urgent because “the threat is still present” after the attacks that began Wednesday with a massacre at the satirical newspaper Charlie Hebdo and ended when three attackers were killed Friday in two nearly simultaneous clashes with security forces around Paris. 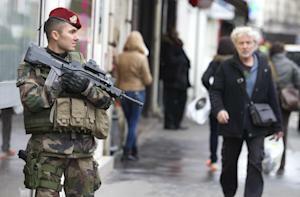 By midday Monday, Paris’ Marais — one of the country’s oldest Jewish neighborhoods — was filled with police and soldiers. Some 4,700 of the security forces would be assigned to protect France’s 717 Jewish schools, Interior Minister Bernard Cazeneuve said. “A little girl was telling me earlier that she wanted to live in peace and learn in peace in her school,” Cazeneuve as on a visit to a Paris Jewish classroom, where the walls were covered with children’s drawings of smiling faces. “That’s what the government, that’s what the Republic, owes to all the children in France: security in all schools, especially in the schools that could be threatened,” he added. The children listened and waved both Israeli and French flags. Defense Minister Jean-Yves Le Drian said the nationwide deployment of troops would be completed by Tuesday and would focus on the most sensitive locations. “The work on these attacks, on these terrorist and barbaric acts continues … because we consider that there are most probably some possible accomplices,” Valls told BFM television. 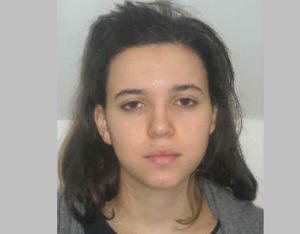 It was not clear exactly how many accomplices French forces were hunting for in addition to Hayat Boumeddiene, the widow of Amedy Coulibaly, the Islamic State group attacker who killed four hostages Friday at a kosher grocery in Paris before being killed by security forces. But several others possible suspects appeared on their radar. French police have said the Charlie Hebdo attacks that left 12 dead were carried out by three people, but only two of those attackers — brothers Cherif and Said Kouachi — have been found. In addition, video emerged Sunday of Coulibaly explaining how the attacks in Paris would unfold. French police want to find the person or persons who shot and posted the video, which was edited after the attacks that ended with Coulibaly being killed Friday. Boumeddiene herself was seen traveling through Turkey with a male companion before reportedly arriving in Syria with him on Jan. 8 — the day after the Charlie Hebdo attack and the same day Coulibaly began his murderous spree by shooting dead a Paris policewoman. Security camera video footage shown Monday by Turkey’s Haberturk Television network showed Boumeddiene arriving at Istanbul’s Sabiha Gokcen airport on Jan. 2 — five days before the first terror attack in Paris. A high ranking Turkish official, who spoke on condition of anonymity, confirmed that the woman on the video was Boumeddiene. Turkish intelligence then tracked Boumeddiene from her arrival. Turkish Foreign Minister Mevlut Cavusoglu told the state-run Anadolu Agency that she had stayed at a hotel in Istanbul with another person before crossing into Syria on Thursday. She and her traveling companion, a 23-year-old man, toured Istanbul, then left Jan. 4 for a town near the Turkish border, according to a Turkish intelligence official who was not authorized to speak on the record. Her last phone signal was on Jan. 8 from the border town of Akcakale, where she crossed over apparently into Islamic State-controlled territory in Syria, the official said. Their Jan. 9 return plane tickets to Madrid went unused. Survivors say the Charlie Hebdo attackers, two brothers from Paris, claimed they were being supported by al-Qaida in Yemen, the group the U.S. considers the most dangerous offshoot of that network. In his video and in comments to French media before he died, Coulibaly pledged allegiance to the Islamic State group, which has taken over large sections of Iraq and Syria. Ties among the three attackers date back to at least 2005, when Coulibaly and Charlie Hebdo attacker Cherif Kouachi, 32, were jailed together. It later emerged that Cherif’s older brother, 34-year-old Said, the other Charlie Hebdo gunman, fought with or was trained by al-Qaida in Yemen. Cherif Kouachi was also convicted in 2008 along with several others of belonging to a network that sent jihadis to fight American forces in Iraq. Israeli Prime Minister Benjamin Netanyahu on Monday visited the Paris kosher grocery where four of the hostages were killed Friday. Volunteers, meanwhile, recited prayers over the bodies of some hostage victims as they were prepared for burial by the Jewish Burial Society in Paris. Associated Press writers Thomas Adamson and John-Thor Dahlburg in Paris; Suzan Fraser in Ankara, Turkey; and Desmond O. Butler in Istanbul contributed. If the United States is a police state, then the Department of Homeland Security is its national police force, with all the brutality, ineptitude and corruption such a role implies. In fact, although the DHS’ governmental bureaucracy may at times appear to be inept and bungling, it is ruthlessly efficient when it comes to building what the Founders feared most – a standing army on American soil. With good reason, a bipartisan bill to provide greater oversight and accountability into the DHS’ purchasing process has been making its way through Congress. A better plan would be to abolish the DHS altogether. The menace of a national police force, aka a standing army, vested with so much power cannot be overstated, nor can its danger be ignored. Indeed, as the following list shows, just about every nefarious deed, tactic or thuggish policy advanced by the government today can be traced back to the DHS, its police state mindset, and the billions of dollars it distributes to police agencies in the form of grants. DHS, along with other government agencies, has been stockpiling an alarming amount of ammunition in recent years, which only adds to the discomfort of those already leery of the government. As of 2013, DHS had 260 million rounds of ammo in stock, which averages out to between 1,300 to 1,600 rounds per officer. The U.S. Army, in contrast, has roughly 350 rounds per soldier. DHS has already distributed more than $50 million in grants to enable local police agencies to acquire license plate readers, which rely on mobile cameras to photograph and identify cars, match them against a national database, and track their movements. Distributed to local police agencies as a result of grants from the DHS, these Stingray devices enable police to track individuals’ cell phones – and their owners – without a court warrant or court order. Each year, DHS funds military-style training drills in cities across the country. These Urban Shield exercises – elaborately staged with their own set of professionally trained Crisis Actors playing the parts of shooters, bystanders and victims – fool law enforcement officials, students, teachers, bystanders and the media into thinking it’s a real crisis. The TSA now searches a variety of government and private databases, including things like car registrations and employment information, in order to track travelers before they ever get near an airport. VIPR task forces comprised of federal air marshals, surface transportation security inspectors, transportation security officers, behavior detection officers and explosive detection canine teams have laid the groundwork for the government’s effort to secure so-called “soft” targets such as malls, stadiums, bridges, etc. Data collecting agencies spread throughout the country, aided by the National Security Agency, fusion centers – of which there are at least 78 scattered around the U.S. – constantly monitor our communications, collecting and cataloguing everything from our internet activity and web searches to text messages, phone calls and emails. This data is then fed to government agencies, which are now interconnected: the CIA to the FBI, the FBI to local police. On orders from the DHS, the government’s efforts along the border have become little more than an exercise in police state power, ranging from aggressive checkpoints to the widespread use of drone technology, often used against American citizens traveling within the country. The DHS has been at the forefront of funding and deploying surveillance robots and drones for land, sea and air, including robots that resemble fish and tunnel-bots that can travel underground. It’s not difficult to see why the DHS has been described as a “wasteful, growing, fear-mongering beast.” If it is a beast, however, it is a beast that is accelerating our nation’s transformation into a police state through its establishment of a standing army, aka national police force. This, too, is nothing new. Historically, as I show in my book A Government of Wolves: The Emerging American Police State, the establishment of a national police force has served as a fundamental and final building block for every totalitarian regime that has ever wreaked havoc on humanity, from Hitler’s all-too-real Nazi Germany to George Orwell’s fictional Oceania. Whether fictional or historical, however, the calling cards of these national police agencies remain the same: brutality, inhumanity, corruption, intolerance, rigidity, and bureaucracy. 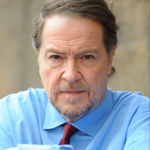 Constitutional attorney John W. Whitehead is founder and president of The Rutherford Institute and author of “A Government of Wolves: The Emerging American Police State.” Whitehead can be contacted at johnw@rutherford.org.